Cops 'n Cowboys is back! 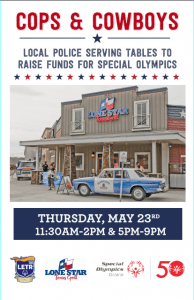 This year, join us on Thursday, May 23rd –for lunch and dinner sessions at LoneStar locations across the province. The lunch session will run from 11:30am to 2:00pm and the dinner session will run from 5:00pm to 9:00pm See y’all there! Walk/run will be approximately an hour, starting at 12:00 PM followed by a pizza party and games. If you have any questions or concerns please contact Carolyn Allan.